I don’t often review holiday specific products on this blog. However, there was something intriguing about Peaceable Kingdom’s Valentine’s Day card collections that piqued my interest. First, they are A-D-O-R-A-B-L-E! Not only do they have some weight and substance to them (unlike the store bought ones I use to give my kids to hand out in school), but they come with messages that are thoughtful, yet not too “sappy”. The “foodie” in me loved the Scratch and Sniff Valentines (Chocolate scented – a bonus!). They are large enough to go through the US mail without being lost, but small enough to not be overwhelming in a backpack. The box that I received had the standard classroom quantity- 28 cards and 28 envelopes (kinda wish they would add one extra envelope for boo-boos). 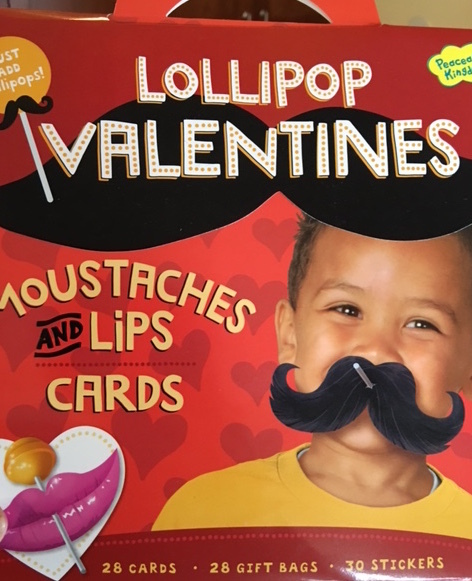 The second pack I received was the more interactive Lollipop Valentine’s with “Moustaches and Lips”. These are a hoot! Imagine dress-up for Halloween blended with the sweetness of Valentine’s Day! Again, 28 was the quantity. Here is an “out of the box” idea for the grown-ups who read this blog. These Valentine’s are not just for kids! Imagine how fun it would be to put some out in your office lounge or at your organization’s meeting? Not only are they a fun discussion starter, but they also show that your place of business or group has a sense of humor sprinkled with compassion. The future, as they say, is in our hands. We consider this every day in everything we do so that our children and their future may be as healthy, as peaceable, as our kingdom today. Also, they don’t just create speciality cards as they are big in to the board game business. Their website also helps promote game inventors, creative kids and much more. People in the San Francisco Bay area who are interested in being a GAME TESTER can learn more via their website. Direct purchase can be made here via the Peaceable Kingdom website. On Amazon you can get the Scented Valentine’s for a very reasonable $5.99 (and if you have Amazon Prime that is even better!) Click here for the direct link. For the Moustaches and Lips box click here. They are priced at $12.99 but are both a lollipop and clever designs. Follow on Twitter Peaceable Kingdom and Facebook.